Waller Creek Is For Brunch? For muffins + empanadas? For Lounging pleasantly as turtles float by? Waller Creek is for muffins and tacos and Saturday brunch? Heck yeah. The Waller Creek Is For Lovers Action And Adventure Society had a fantastic brunch last Saturday just south of 6th Street on Waller Creek. Have you ever stopped and lingered there? Had a apple turnover and talked with friends? Noticed the turtles floating by in the Creek or the looming fake cliff (on which it seemed a condor or some other ridiculous animal would appear at any moment) or how much cooler and pleasant it is down there as opposed to street level? In short, it is the entirely other-worldly and wonderful. You should try it sometime, we think you will be pleased. What is the Waller Creek Is For Lovers Action And Adventure Society? More information will be forthcoming in the near future but in short it is a group of people dedicated to challenging how we (the people of Austin) use, perceive and thereby re-design Waller Creek. Is Waller Creek for badminton, egg salad, theater, marching bands? For slip n’slides and horseshoes? How do you know if you haven’t tried it? What is Waller Creek for you? Do you want to try some different? Take Waller Creek for a test drive while having muffins with friends? Stay tune, information on the time, date and location of the next Waller Creek Is For Brunch will be posted here shortly. 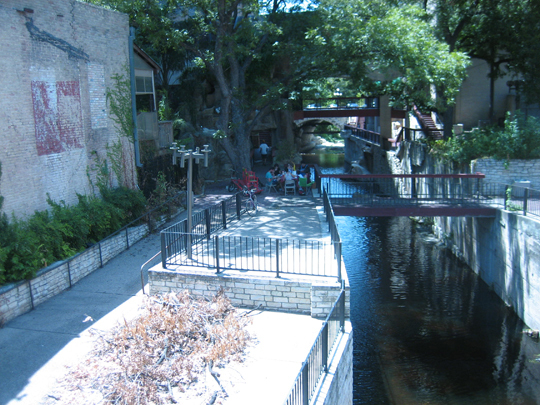 Tags: austin, make austin weirder, temporary land use policy, Waller Creek Is For Lovers! I think all of the cool stuff will be gone and we will be eating Applebees food in front of the Gap when the city is done remodeling the creek with our tax dollars. I believe it will be another Domain. All of the beautiful bars on Red River gone like Liberty Lunch. Right now, as I understand it, the plans are in motion for Waller Creek’s future but there’s a lot about those plans that is entirely up-in-the-air. Also, there’s still a considerable amount of time before they even start digging, much less finish it. Given at least some of the work will require publicly supported money, getting people to simply start using the space today and possibly in ways they’ve never considered is the best first step we can imagine. Part of the current problem is that nobody really uses the space other than when a big event comes to town. Relatively few people know about it and because the bike path isn’t connected to much of anything and is in disrepair, few people even pass through the area. It’s hard to get people riled up or even to advocate for different uses if they have never used it. The fact of the matter is that it’s a tremendous resource with a lot of beautiful nooks and crannies but it doesn’t have playing fields, playgrounds or a big swimming hole, so how do we use it? I couldn’t be more excited about figuring this out with the rest of the Waller Creek Is For Lovers Action And Adventure Society and anyone else who wants to join in the fun. You should come along. P.S. Where are the brunches located (specifically, the one this Sunday, Sept. 13)?